The Microsoft Azure cloud offers a lot of services for almost every scenario that you might need. 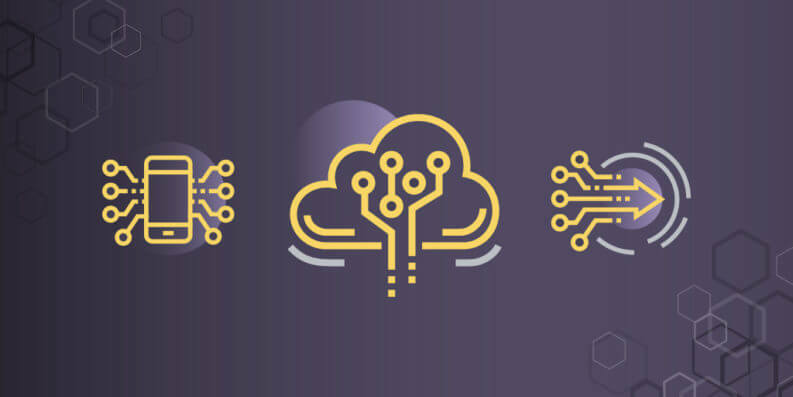 You can categorize these services into cloud computing types like IaaS, PaaS and SaaS to determine the amount of control and responsibility you have versus the time you can spend on building things that matter. Typical IaaS services are Container Service and Virtual Machines. These allow you to have a lot of control over how you run them but also require you to be responsible for things like the OS, Antivirus and Load Balancing. Because of this, you and your team can spend less time working on adding business value. Examples of PaaS services are App Services, Azure Search and Azure CDN. You don’t have to worry about the OS or even the server, you can just run your application. 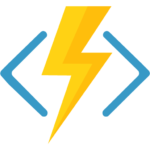 You are responsible for some server configuration, like scaling, although for some services, like Azure Functions, that happens automatically. Examples of SaaS services are things like Azure IoT Suite and Office 365. SaaS is the highest abstraction level and allows you to just use the application, you don’t even have to build it. You just configure it. No need to worry about the OS or even scaling the app. This allows you to work on business value, but offers you little control over your application. For software developers, PaaS is a great cloud computing type to use. You have enough control to just work on your application and tweak it to be just right and you don’t have to worry about all of the operations stuff. Things just run without worrying about OS patches or load balancing. Azure has a very strong PaaS offering, which is very attractive for developers. 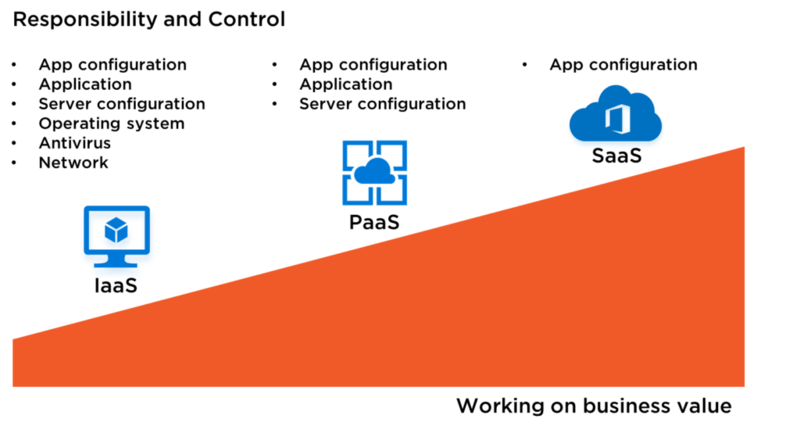 This article will discuss the top Azure PaaS services for developers that can make your application better. One of the core Azure PaaS services is Azure App Services. Azure App Services provide multiple service types, each geared towards hosting your application or business logic for a specific use case. Additionally, the App Service types share common capabilities like auto-scaling, authentication and authorization and custom domains and SSL. Azure App Service Web Apps are essential if you want to host a standard ASP.NET web application. Web Apps are an abstraction of a Web Server like IIS or Tomcat and can run applications that are written in .NET, PHP, Python, Node.js, Java and more. They are very easy to setup and provide you with lots of benefits out-of-the-box, like the fact that by default, they are available 99.95% of the time. No need to worry about downtime. App Services are now available for Windows and Linux both. These allow you to test the new version of your application and deploy it to production with no downtime. They even allow you to route some of your production traffic to the new version of your app, to see if it works as expected. Creating a new Web App or Logic App is simple through the Azure Portal, but you should really automate your deployments so that you can repeat them in different environments and run the exact same configuration. You can do that by creating Azure Resource Manager (ARM) templates that you deploy from Visual Studio or in a continuous delivery pipeline using a service like Visual Studio Team Services. ARM templates describe your resources like Web Apps, Azure SQL Databases and resource groups in JSON documents. You can create them using the Azure Resource Group project template in Visual Studio and get inspiration by clicking on the Automation Script button on any resource in the Azure Portal. 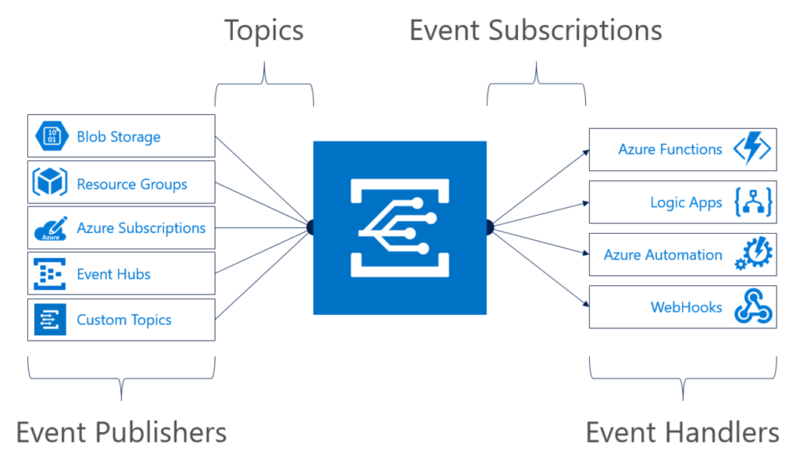 A relatively new service, Azure Event Grid, acts as the glue between services. Azure Event Grid can route events from any source to any destination. Almost every Azure service can publish events that Azure Event Grid can receive and use to trigger your application with. You can also have your own applications and services publish events that Azure Event Grid can use to route to other services. Azure Event Grid scales automatically and you only pay for the number of operations that you use. Azure Event Grid eliminates the need for polling. Your applications can listen for and react to events from whatever service published events to Azure Event Grid. You can, for instance, have Azure Event Grid listen to changes in your mailing list and trigger an Azure Logic App when something changes. One of the oldest and most used and reliable services in Azure is the Azure Service Bus. It consists out of multiple services, most notably Azure Service Bus Queues and Azure Service Bus Topics. An application can put messages on an Azure Service Bus Queue. Each message is read from the queue and processed by one application. Azure Service Bus Queues have some advanced capabilities that you get out-of-the-box like duplicate detection and a dead-letter sub-queue where messages that can’t be processed are moved to. Azure Service Bus Topics are a bit different. 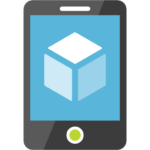 Applications can put messages on an Azure Service Bus Topic and multiple applications can read and process the message. They receive the messages that have attributes that they are interested in. They subscribe to ‘topics’ on the queue. Azure Service Bus Topics have the same advanced capabilities as Queues do. Both of these services allow you to decouple the application that puts messages on the queue from the application that processes the messages. This pattern enables the processing application to process tasks at its own pace without making the user wait on it. This is useful when processing can take a while and you don’t want the user to have to wait on that, for instance when you are processing an order request that can take 5 minutes. You store large files, or ‘blobs’ in Azure Blob Storage. These can be things like VHD files or audio or video files or database backups. You can choose a tier of Blob storage that determines your performance and costs. There is the Hot tier, for Blobs that you access frequently. There’s also the Cool tier, that you use for Blobs that you don’t access that often, maybe once a month. And then there is the Archive tier, for Blobs that you use almost never. When you request a Blob from the Archive tier, it could take hours before you can access it. You can store semi-relational data in rows and columns using Azure Table Storage. This is perfect for things like logging data. You store data in tables that are similar to those in SQL Server, but are less strict in that they don’t have relationships between them. Azure Table Storage is fast and relatively inexpensive, just like the other types of Azure Storage. You can store small messages that can be picked up and processed later in Azure Storage Queues, just like the Azure Service Bus Queues. This is a bit of a strange offering because it overlaps with the Azure Service Bus Queues. They are different in that Service Bus Queues have duplicate detection and Storage Queues don’t. Also, Service Bus Queue messages remain available after 7 days, where Storage Queue messages can only be stored for 7 days. You can use Azure File Storage as an extra hard disk that you mount to your computer or a VM. This is a great service to get started with the cloud by migrating your files to it. You can have applications use it by just pointing them to Azure File Storage instead of their own hard disk. This allows you to start moving to the cloud. Azure Disk Storage is a premium feature and is highly performant and useful for when you need to perform I/O intensive work, like on a primary hard disk of a VM. It acts as a scalable, high-performance disk that you can mount to a VM. 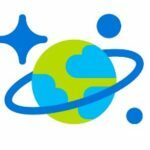 The new version and name of Azure DocumentDB is Azure Cosmos DB. 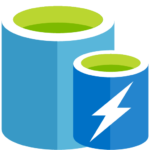 Azure Cosmos DB is a database offering that fits the cloud perfectly. As a PaaS service, you just spin a Cosmos DB up and you’re ready to go. 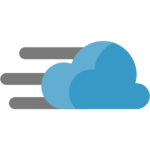 If you were using Azure DocumentDB, you are now automatically using Azure Cosmos DB. Your code doesn’t have to be changed. Learn how to get started with Azure Cosmos DB in these 5-minute tutorials. 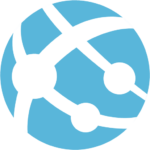 Cosmos DB is most suited for non-relational or semi-relation data. 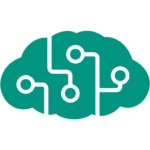 The Cognitive Services are very easy to use as you just use them from the cloud and you don’t need to manage any infrastructure or configuration. You can use your own data to train the services to enhance your results. Doing this, the Face API could, for instance, return the names and ages of your coworkers. Additionally, the Cognitive Services learn on the fly, by the data you feed them. This makes them smarter and more accurate. You can see in the output that this particular service returns a lot of data. It even detects where facial features are located in the picture and if the person is wearing makeup. I think that’s really amazing. You can use Azure CDN by creating an Azure CDN Endpoint, coupling that to a source, like Azure Storage and upload files to the Azure Storage. Azure CDN automatically replicates the files to the PoPs all over the world and you can link to the files through an URL like https://custom.azureedge.net/cd/myimag.png. You can also use a custom domain name for the URL. Another way to speed up your applications is by caching data using Azure Redis Cache. When you get data from a cache instead of from another data store, like a database, you speed up your application. That is because a cache like Azure Redis Cache holds data in-memory and stores data in a simple key/value format. Because of this, data can be served quicker as it doesn’t have to be retrieved from disk and it doesn’t have to be retrieved by executing a complex query. Azure Redis Cache provides a cache-as-a-service and provides advanced capabilities, like clustering and geo-replication. It is based on the popular open-source Redis Cache and is now backed by Microsoft SLAs and enterprise support. Azure Redis Cache is the caching option for applications in Azure. 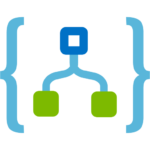 You can use Azure API Management to enhance your APIs or third-party APIs that you use. Azure API Management acts as a gateway between your API and the outside world. This allows you to enhance your API. You can control the usage of the API by setting limits per user or subscription type. This is a good way to monetize your API by for instance offering a free usage tier up to 10 requests per day, and if you need more, you start paying. If users try to use more, without the right subscription, their requests get throttled. Additionally, you can enhance APIs by making them more performant. You can cache API responses so that they don’t have to get the responses by doing calculations or composing data from a data source. And you can protect your APIs with keys, passwords, certificates and IP filtering. On top of that, you can transform the input and output to and from your APIs. You could, for instance, transform incoming XML to JSON or do the same with responses. Azure API Management is really powerful and increases the control that you have over your APIs (and third-party APIs that you expose through API Management). And it allows you to do that without changing the API. The services in this article are all examples of Azure PaaS services. All of them are very easy to spin up and require minimal maintenance. They will stay up and running, are self-healing and basically ‘just work’. The value that these services can provide is enormous and easy to incorporate into your applications. This truly takes care of a lot of the plumbing and repetitive tasks that we used to build and do ourselves. 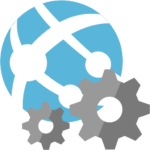 Azure PaaS lets us focus on building things that matter!